12 July 1999 -- In today's tour update from Doug Flavelle, Director of Artist & Media Relations for True North Records/Finkelstein Management, the news is good. "Bruce will be doing a limited number of solo dates in North America until February 2000," reported Flavelle, "Starting February 2000 there will be an extensive North American tour with a band." 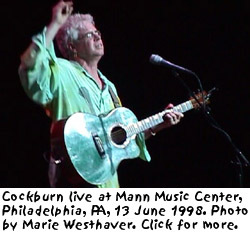 Cockburn is already known to be playing dates in the UK and Ireland at the end of July/beginning of August 1999. "Bruce will be back in Europe during parts of October and November this Fall/Autumn," Flavelle added, an announcement that will surely delight Cockburn's European fans. The tour update also announced four new dates in the US during the second half of September, in New York, New Jersey, Boston and Chicago. See the gigs page on this website for more information.